Who invented the first garage sale? 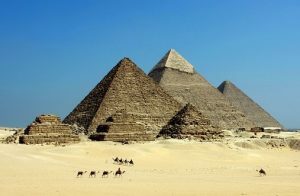 Perhaps Uk and Ukette of prehistoric fame discovered the extra rocks sitting around their cave were gathering dust. 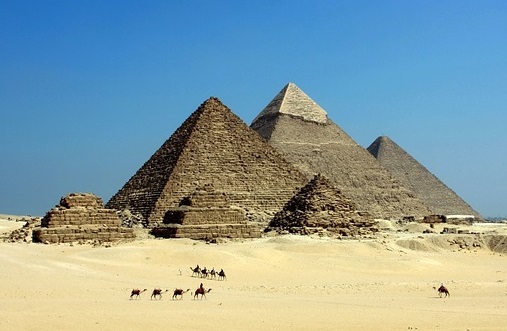 Some authorities on ancient civilizations claim the Egyptians, disgusted at having to rent extra Pyramids to accommodate junk their kids brought home from college, decided they’d had enough. Whoever originated the concept did so without the aid of the Internet. In consulting websites, I discovered one (researched by a Ph.D. in Junkology) that listed 101 tips for running a successful sale. Googling “garage sale” produces more than six million results. Not surprising, because every single respondent visited our small town during Labor Day weekend. 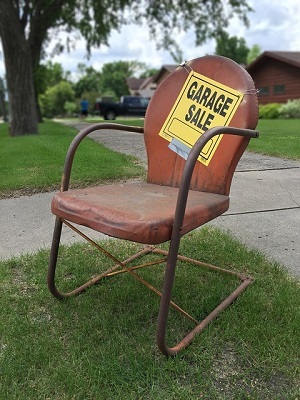 Because of our city-wide, garage-sale tradition, hundreds of women price their husbands’ lucky 1979 The Doobie Brothers tour T-shirts and golf clubs, while men sneak wives’ five-closet shoe collections and 537 Longaberger® baskets out to garages and driveways. All hope to dispose of such “useless” clutter before spouses discover the absence — only to realize that by holiday’s end, the men have bought six sets of used golf clubs and the women have purchased purses to match all the shoes. My passion for cheap sometimes has strained the seams of my house and my husband’s patience. So I prepared for this garage sale mega-event with moderation in mind. Besides, Hubby hid the truck keys. 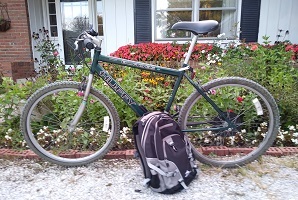 So I rode my bike, carrying a backpack and limited cash. I chatted with half the town as I bought storybooks and toys for my grandkids, CDs to replace favorite cassette tapes, and a muffin pan to replace those I’d received at a wedding shower — 42 years ago. I’d have to write a book to list all the excellent, useful items I passed by. (Sigh.) Certainly, not all garage sales present such a tempting array. Nowhere did I encounter the used toothbrushes, deodorants or surgical instruments (!) some Internet cohorts encountered. Unlike one yard sale queen, I didn’t buy a white toilet plunger decorated with a bride and groom, labeled, “We took the plunge.” Nor did I buy a fountain constructed of five stainless steel bedpans with a frog (also created from a bedpan) poised to dive in. Miraculously, my husband, who rates garage sales only slightly above taxes and lima beans, had changed his tune. Seeing the multitude, he sold our old lawnmower within an hour. I was glad he reformed his attitude toward garage sales. But next year, before I make my annual rounds, will I have to hide all my shoes? Your Extraordinary Ordinary: What’s your all-time favorite garage sale find? This entry was posted in Coffee Corner and tagged Garage Sales, Holidays, Humor, Labor Day, Marriage, Rachael O. Phillips on September 6, 2017 by rachael. An iron skillet at that price was a treasure find! It was an incredible find, Kim! LOL, my kids made fun of me because I treasured it as if it were made of gold!